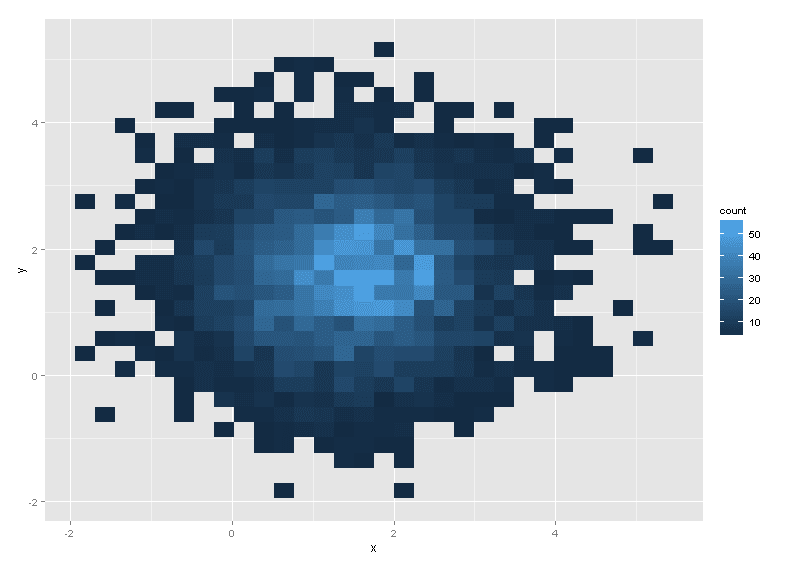 Lately I was trying to put together some 2D histograms in R and found that there are many ways to do it, with directions on how to do so scattered across the internet in blogs, forums and of course, Stackoverflow. As such I thought I’d give each a go and also put all of them together here for easy reference while also highlighting their difference. 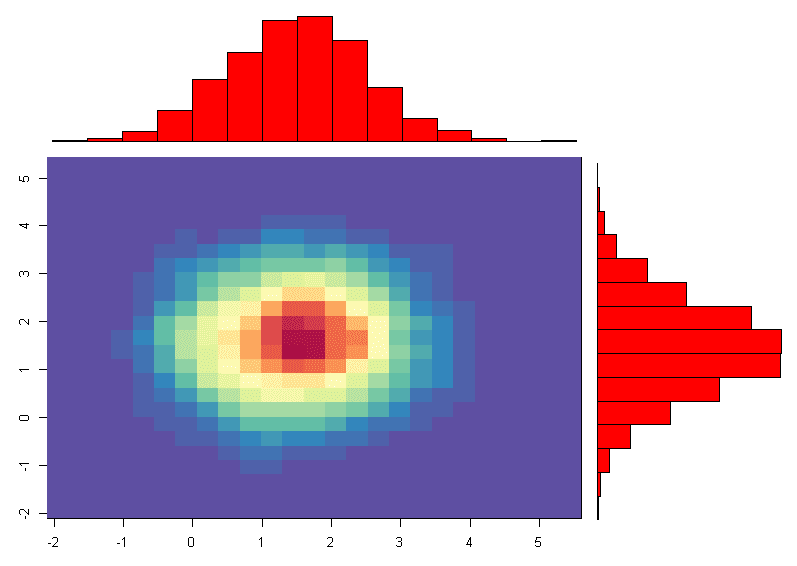 For those not “in the know” a 2D histogram is an extensions of the regular old histogram, showing the distribution of values in a data set across the range of two quantitative variables. 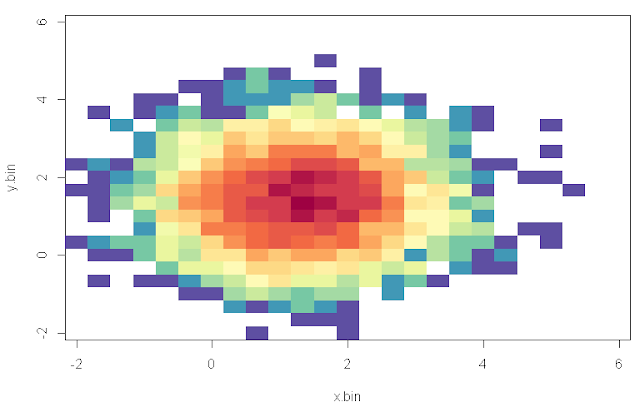 It can be considered a special case of the heat map, where the intensity values are just the count of observations in the data set within a particular area of the 2D space (bucket or bin). 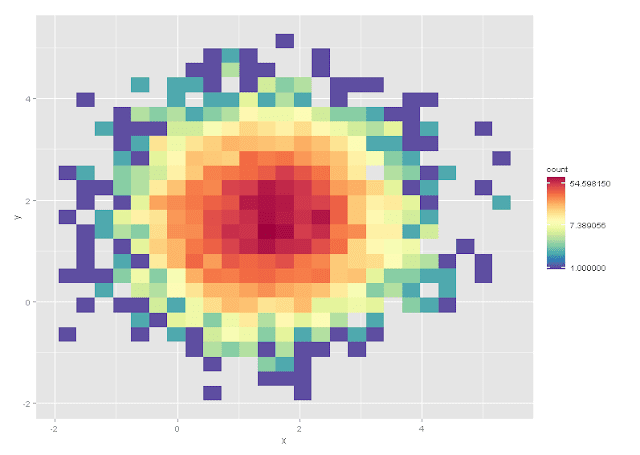 So, quickly, here are 5 ways to make 2D histograms in R, plus one additional figure which is pretty neat. 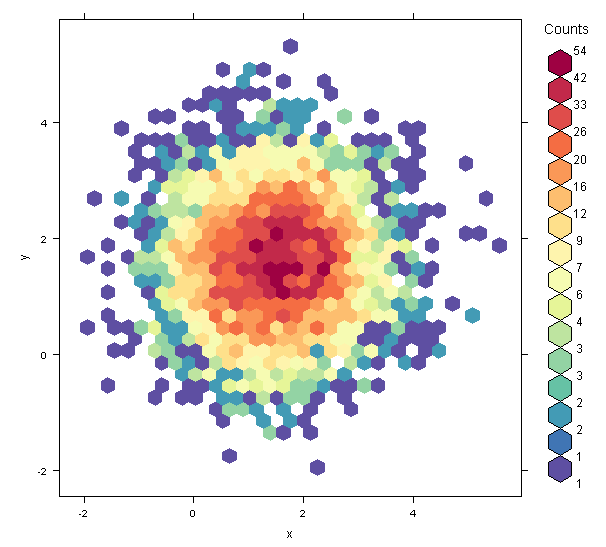 First and foremost I get the palette looking all pretty using RColorBrewer, and then chuck some normally distributed data into a data frame (because I’m lazy). 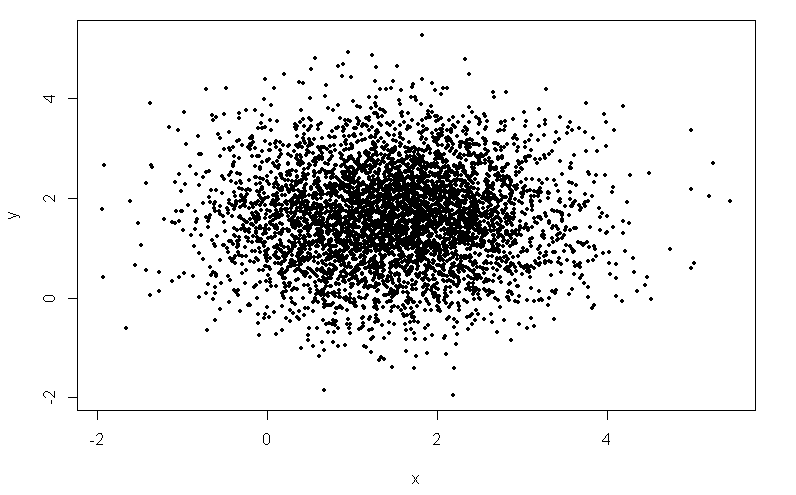 Also one scatterplot to justify the use of histograms. 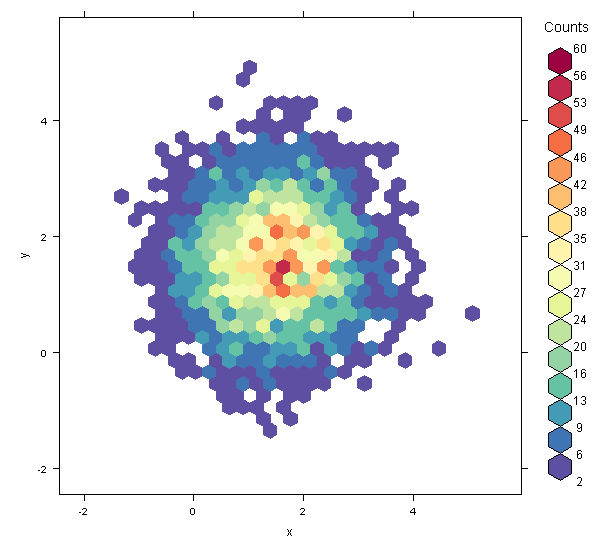 The hexbin package slices the space into 2D hexagons and then counts the number of points in each hexagon. The nice thing about hexbin is that it provides a legend for you, which adding manually in R is always a pain. The default invocation provides a pretty sparse looking monochrome figure. Adding the colramp parameter with a suitable vector produced from colorRampPalette makes things nicer. The legend placement is a bit strange – I adjusted it after the fact though you just as well do so in the R code. Using the hexbinplot function provides greater flexibility, allowing specification of endpoints for the bin counting, and also allowing the provision of a transformation function. Here I did log scaling. Also it appears to handle the legend placement better; no adjustment was required for these figures. Setting the colors and adjusting the bin sizing coarser yields a more desirable result. We can also scale so that the intensity is logarithmic as before. 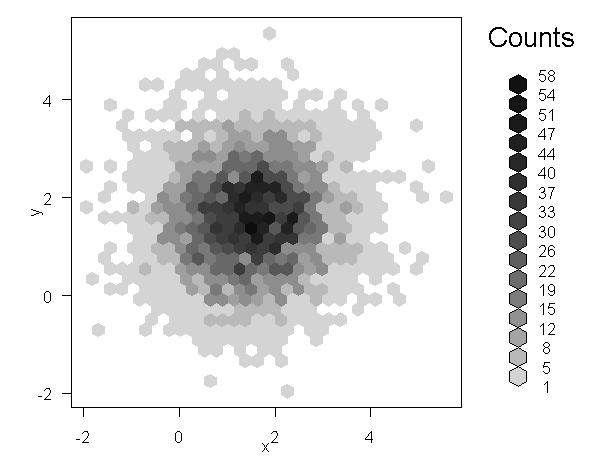 And of course, where would a good R article be without reference to the ggplot way to do things? 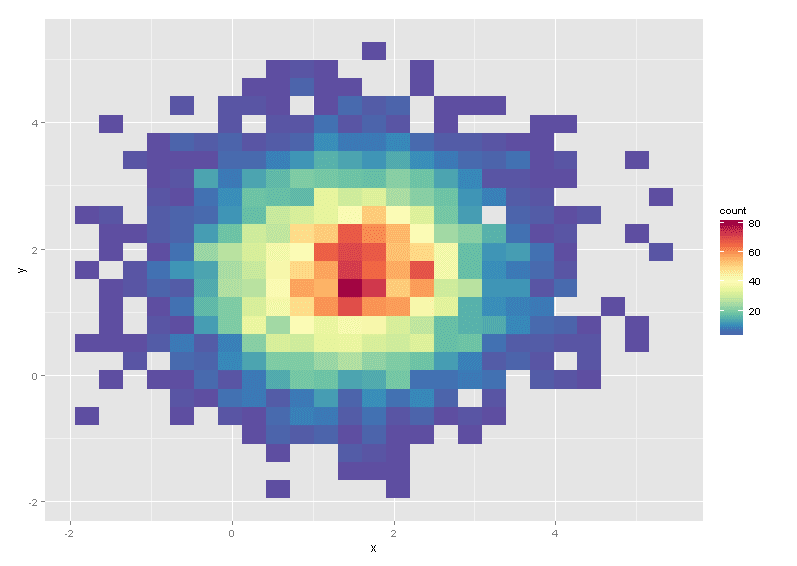 Here we can use the stat_bin2d function, either added to a ggplot object or as a type of geometry in the call to qplot. 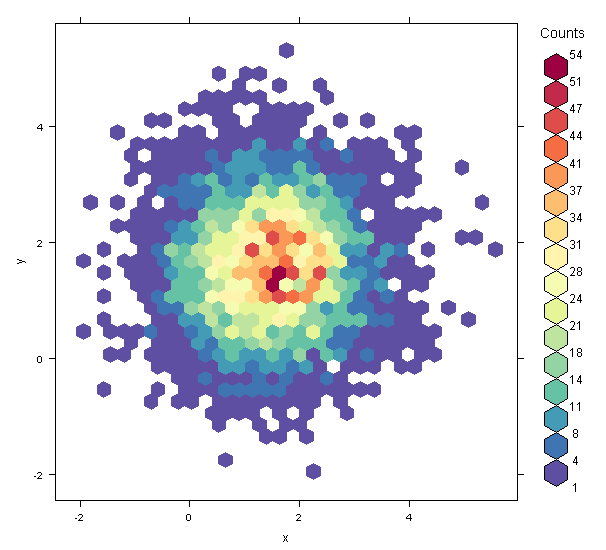 Again, we probably want to adjust the bin sizes to a desired number, and also ensure that ggplot uses our colours that we created before. The latter is done by adding the scale_fill_gradientn function with our colour vector as the colours argument. Log scaling is also easy to add using the trans parameter. 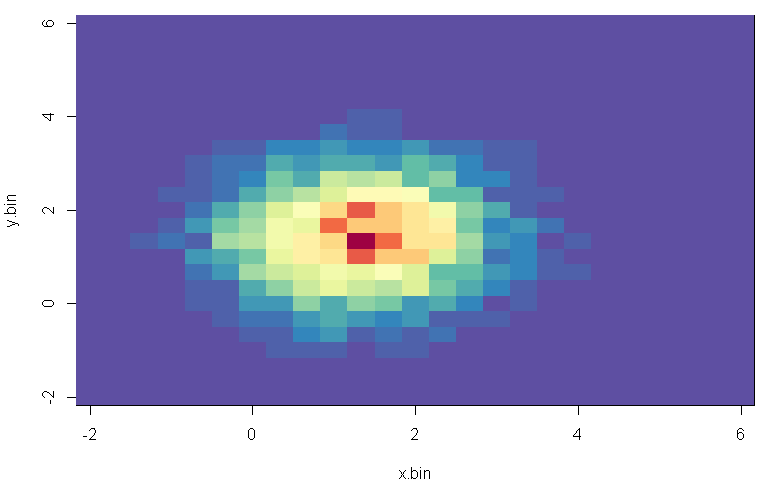 Option #4 is to do kernel density estimation using kde2d from the MASS library. 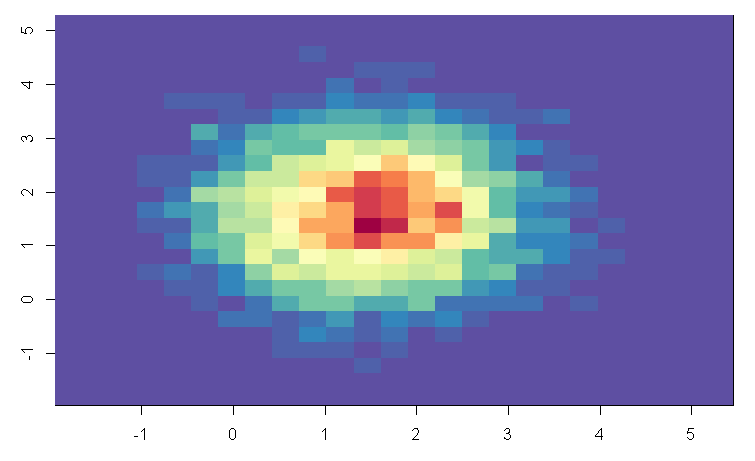 Here we are actually starting to stray from discrete bucketing of histograms to true density estimation, as this function does interpolation. The default invocation uses n = 25 which is actually what we’ve been going with in this case. 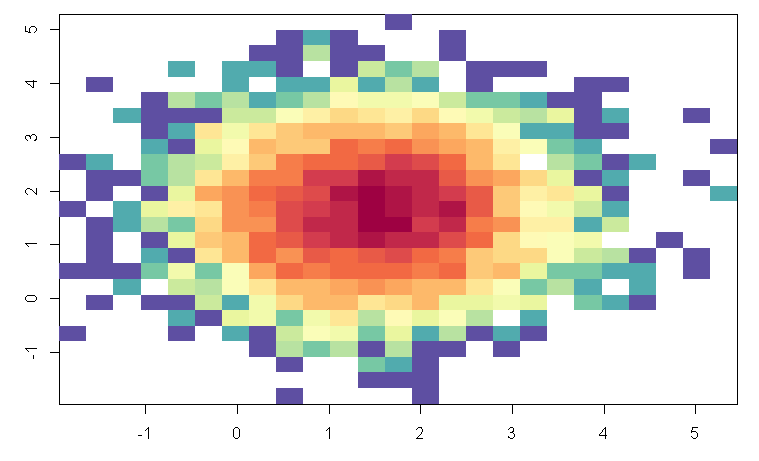 You can then plot the output using image(). Setting n higher does interpolation and we are into the realm of kernel density estimation, as you can set your “bin size” lower than how your data actually appear. 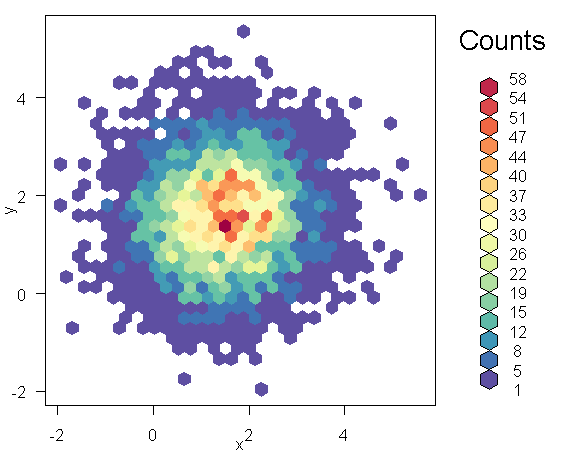 Hadley Wickham notes that in R there are over 20 packages [PDF] with which to do density estimation so we’ll keep that to a separate discussion. Lastly, an intrepid R user was nice enough to show on Stackoverflow how do it “the hard way” using base packages. Not the way I would do it, given all the other options available, however if you want things “just so” maybe it’s for you. Lastly I thought I would include this one very cool figure from Computational Actuarial Science with R which is not often seen, which includes both a 2D histogram with regular 1D histograms bordering it showing the density across each dimension. So there you have it! 5 ways to create 2D histograms in R, plus some additional code to create a really snappy looking figure which incorporates the regular variety. I leave it to you to write (or find) some good code for creating legends for those functions which do not include them. Hopefully other R users will find this a helpful reference.